Just wanted to let you know that I am going to take a few weeks off blogging. Everything is fine, I am just taking a little break. I will miss you and want you to know how much I appreciate each and every one of you. I hope that the rest of the summer is a wonderful time for you and your families. I am excited to get back to creating and show you what I have been working on. God Bless you all. Good Monday morning blog friends. So glad you stopped by. 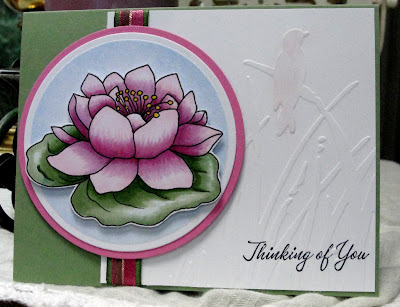 Today's card is for our #6 Challenge here at Heart Song Designs. I chose to use our Waterlily image to capture what summer means to me. My husband and I go fishing on the river and I love to see all the birds and lily pads. Last time we went I even saw a bald eagle. How awesome is that? Paper: Wild Wasabi, Pixie Pink, Whisper White, X-Press It Blending paper. Accessories: Copic Markers, Cuttlebug embossing folder "Bird Call". Green and Pink ribbon, Sincere Salutations Sentiments. Stampin Dimensionals. 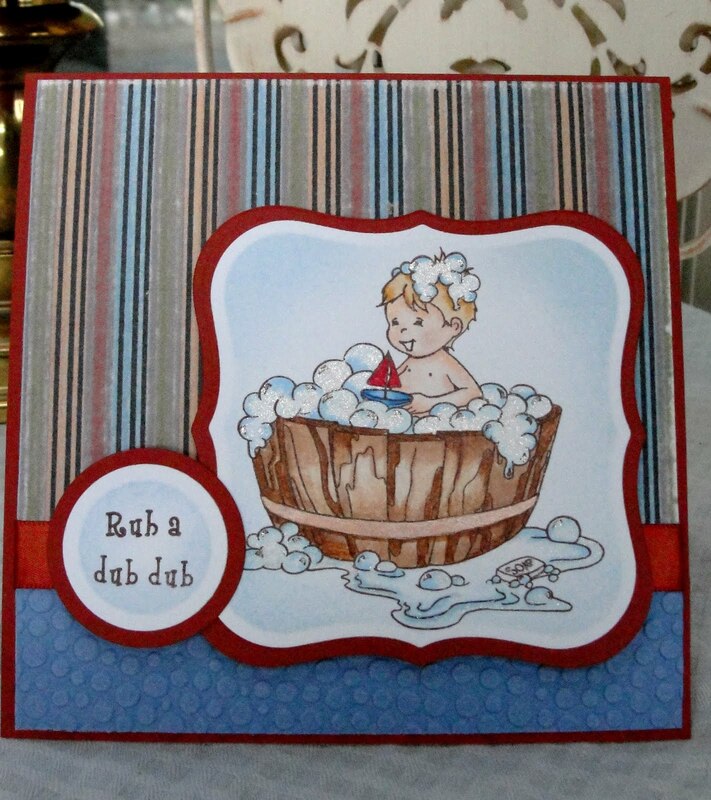 Please stop over to Heart Song Designs Inspiration Blog and play along with us. We love to see what your creations and don't forget to pick up your FREE Challenge Digi image. We are also having a Design Team Call. Happy 4th of July blog friends. 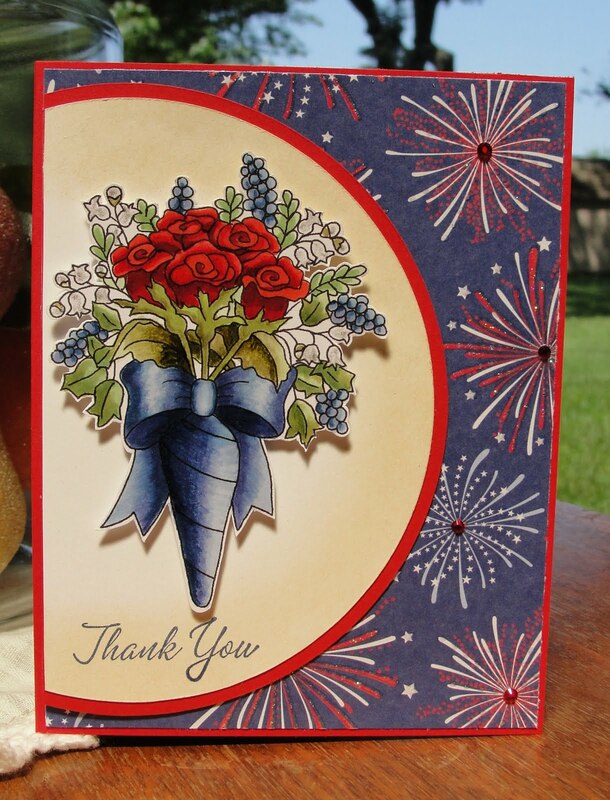 I made this card to honor the men and women of our armed forces. Freedom is so precious and I wanted to show my gratitude for all that they do. I used Heart Song Designs Wedding Bouquet digi stamp for my card today. This week's challenge is a fun one and very appropriate for the holiday today but you can be creative and make it all occasion too! Use Red/White & Blue AND/OR do some paper piecing! be sure to stop by HERE to grab the new free digi that is up for July and to read our rules of play. Looking forward to seeing what you create! 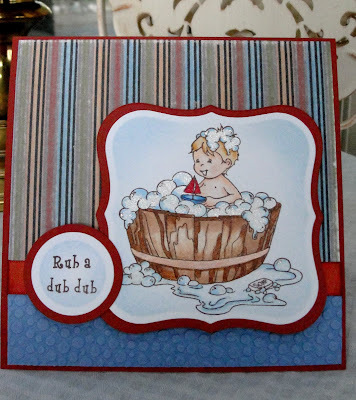 Paper: X-Press It Blending paper, Whisper White, Real Red, Best Creations designer paper. Accessories: Copic Markers, Spica Clear Glitter Pen, Swarovski Crystals, Creative Memories Circle Cutting system, Stampin Up Diemsnionals. I hope you all have a wonderful holiday weekend. Thank you for stopping by. Hi blog friends. 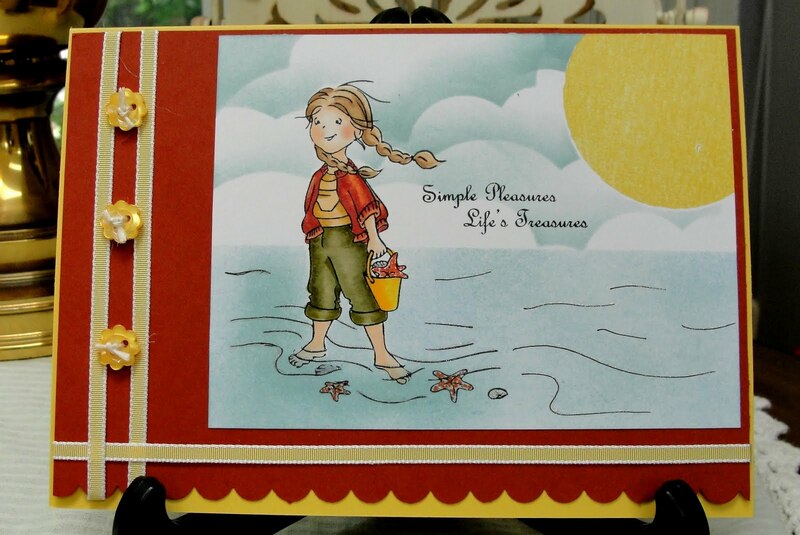 Thanks for joining us today at Paper Pretties for our color challenge using red, orange, yellow and a neutral color. 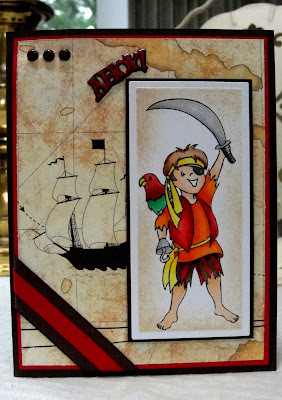 I used adorable "Pirate Cooper" and had this wonderful designer paper by Sandy Lion called Treasure Map. It has the perfect colors for this challenge. Please go to Paper Pretties blog and play along with us. We would love to see your creations. Paper: Early Espresso, Real Red, X-Press It Blending paper, Sandy Lion designer paper. Accessories: Copic Markers, Long Rectangle Nestabilities, Brown and Red Grosgrain ribbon, Brown brads and Pirate Brads, Stampin Dimensionals. As this is my last post as a guest designer for Paper Pretties, I want to thank Heather for giving me this wonderful opportunity to be a part of Paper Pretties most talented design team. I also want to thank Frances Byrne our amazing design team coordinator for all of her hard work and her ability to make me feel so welcome and keep everything so organized. You're the best Frances. Good Monday morning blog friends. 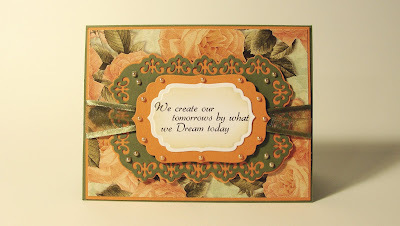 So glad you stopped by today for our blog challenge. We would love it if you played along with us. 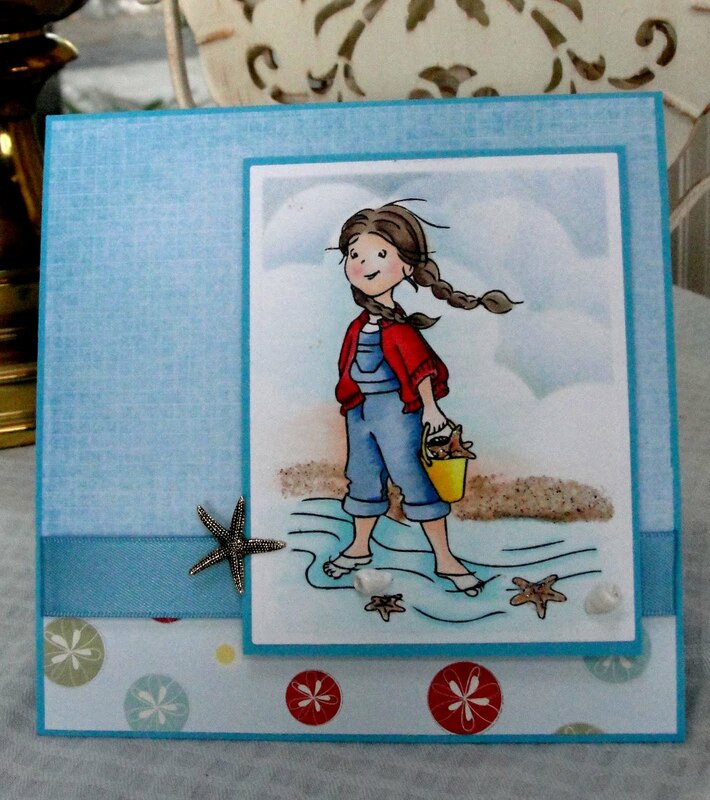 Today's challenge is to use scallops and or paper piercing on your card. 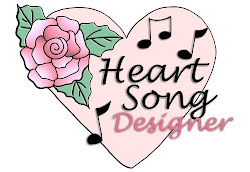 * You are NOT required to use a Heart Song Designs image to play, but if you have one we'd love to see it! *Choose one of the challenges offered or do both! *This is the free digi offered for the month. We'd love for you to use it:) If you do use it or any Heart Song image you are given 2 entries for the weekly drawing of 2 free images from the Heart Song shop. *One entry per person; No back links, please. *Come check back to see if you were chosen as a featured artist and claim your "I was featured" badge. Paper: Tempting Turquoise, Pumpkin Pie, X-Press It Copic Blending Paper, Cosmo Cricket designer paper. Accessories: Copic Markers, Orange Satin, Turquoise and Pumpkin Pie Grosgrain ribbons, Swarovski Crystals, Scallop border punch, Long Rectangle Spellbinders Nestabilities, paper piercer and Stampin Dimensionals. Good morning beautiful blog friends. I am so glad that you stopped by today. 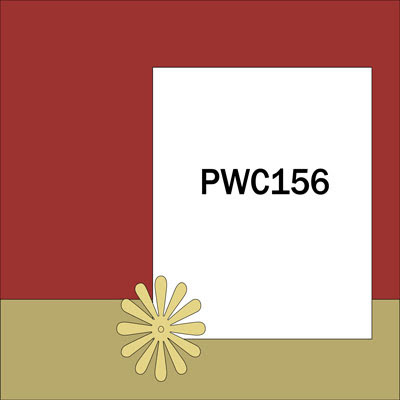 Here is my card for the Paper Pretties White on White Challenge. This was a difficult challenge for me because I just love all colors, but I gave it a try and I hope you like it. We would love it if you played along with us. Go to Paper Pretties for all the details. 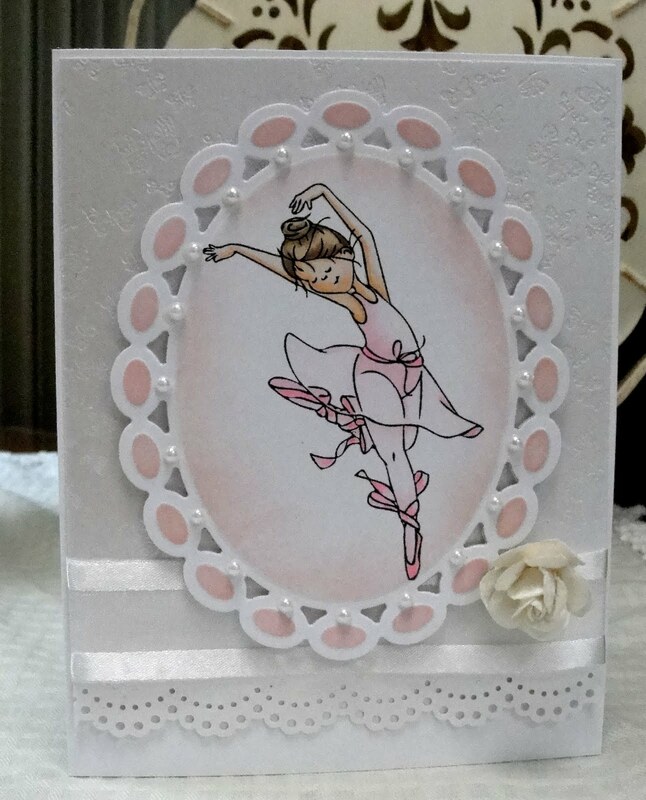 I used "Ballerina Sophia" and colored her with Copic Markers and cut her out using Beaded Oval Nestabilities. The designer paper is from Bazzill's wedding paper. Accessories: Copic Markers, Beaded Oval Nestabilities, Prima Fairy Tale Roses, Kaiser Kraft White Pearls, Stampin Up ribbon, Martha Stewart edge punch, Stampin Dimensionals. Thank you again for visiting and have a blessed day. 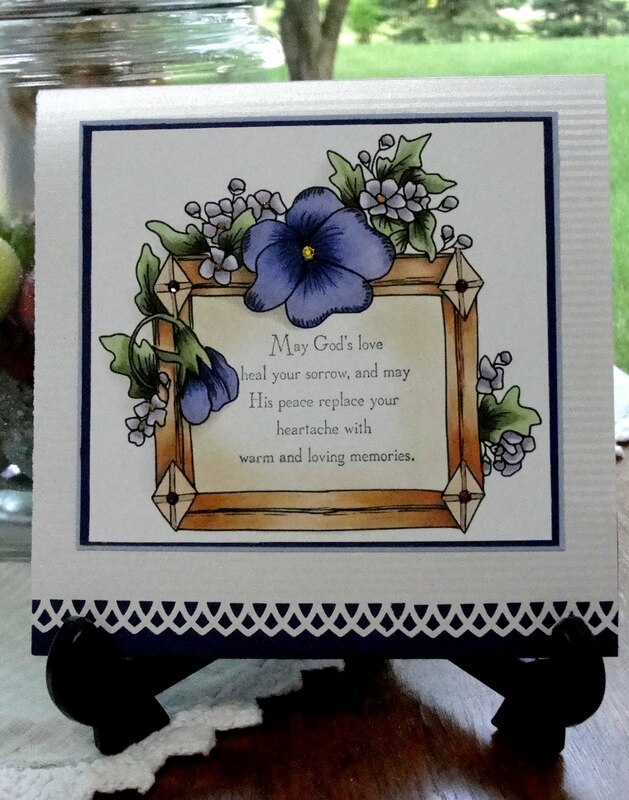 Heart Song Designs "Pansy Frame"
Welcome everyone, so glad that you stopped by today. Here is my card for Heart Song Design's Flower Challenge. I just love this image it lends itself to so many occassions and is beautifully drawn by Leah. Please stop by our Inspiration Blog and play along. We would love to see your creations. 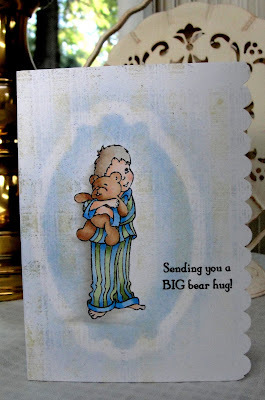 For our Single Layer Card Challenge over at Paper Pretties I made this using "Beary Best Friend Cooper". He is such a sweet little guy. This was quite a challenge for me. I can't remember the last time I made a single layer card. I wanted to add dimension so I used a background stamp and laid my Labels Ten Nestabilities on top of the image and sponged around it. Hope you like it. Heart Song Designs "Watering Can"
Good morning friends, I am so glad that you stopped by today. I made this card for my dear friend who lost her dad. He was a very kind man who loved flowers and had a green house. 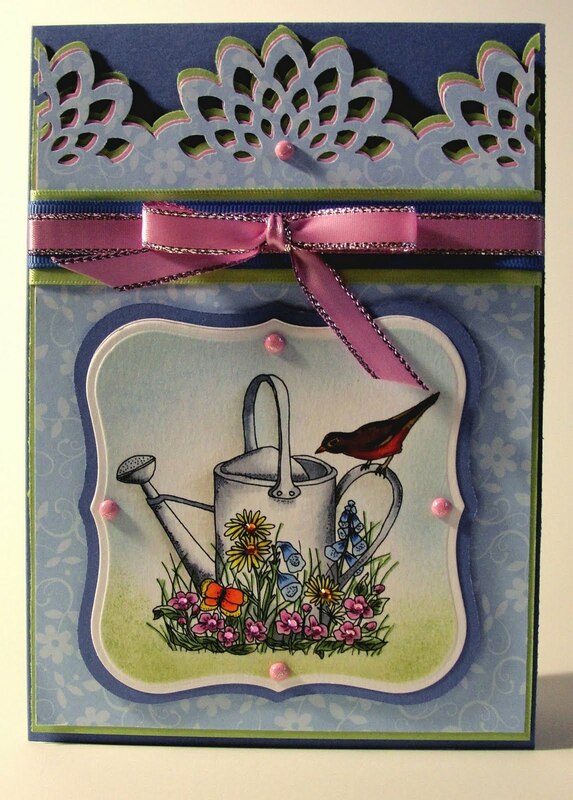 This beautiful digi image "Watering Can" from Leah at Heart Song Designs is perfect for our challenge ( Buttons, Bling and Bows) today as well. Please join in the fun and play along with us. Head over to Heart Song Designs Inspiration Blog for all the details. Paper: Brocade Blue, Lavender Moon, Pear Pizzazz, Georgia Pacific White, retired Stampin Up designer paper. Accessories: Copic Markers, Lables One Nestabilities, Sugar Coated Brads, Swarovski Crystals, Martha Stewart's Flower Burst punch, Spring Moss, Brocade Blue and Pink Satin ribbon, Stampin Dimensionals. Please forgive my very late post. I was in the middle of posting yesterday when a tree fell in our yard and took out all of our power. UGH!! We are finally up and running so here is my post. 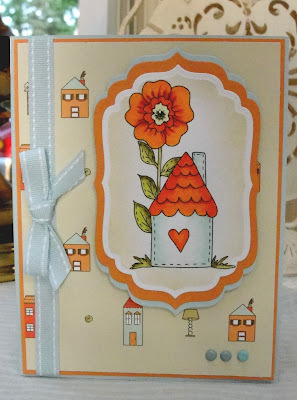 Hi everyone and welcome to Paper Pretties Blog Hop. Join us for our release Blog Hop this Wednesday 12 AM EST 8th June, starting on the Paper Pretties Blog. 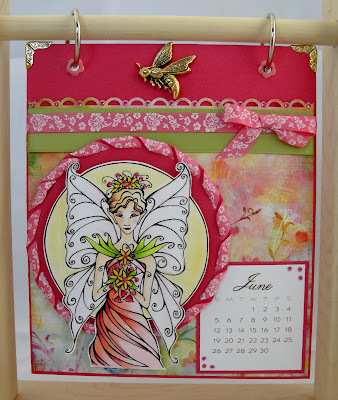 New Release Stamps available in the Paper Pretties Boutique from Wednesday 12 AM EST 8th June. Thank you for stopping by and have a wonderful night. Paper Pretties Sneak Peek "Sophia"
Here is another Sneak Peek of one of the new June releases from Paper Pretties. I love little Sophia and here she is having fun at the beach. I have a little bag of sand and these tiny real sea shells and thought that they would add just the right touch on my card. Hope you like it. Accessories: Copic Markers, Classic Rectangle Nestabilities, Marina Mist Satin ribbon, sand and tiny sea shells, Star fish charm, Cloud Stencil, Stampin Dimensionals. Good Monday morning everyone. I hope that you are all doing well. 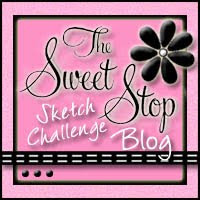 We are having a sketch challenge over at Heart Song Designs today and would love for you to join in on the fun. If you play along with us you can get this adorable digi image free from Leah. Just visit the Heart Song Inspiration Blog for all the details. Hope to see you there. We can't wait to see your beautiful creations. Accessories: Copic Markers, Swarovski Crystal, Lables Four Nestabilities, Soft Sky Stitched ribbon, Stampin Dimensionals, Soft Sky Brads. I really appreciate you stopping by today and hope you have a wonderful day. 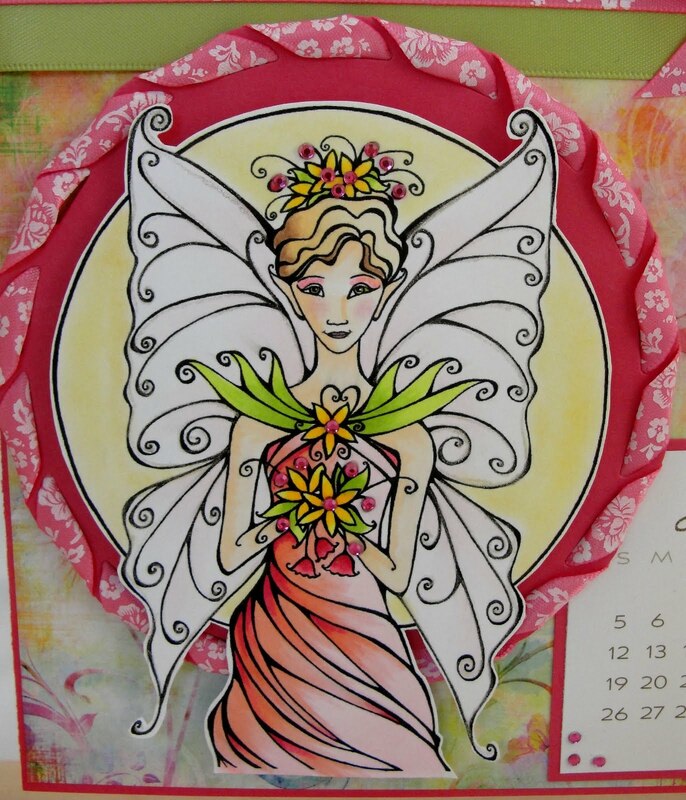 Paper Pretties Sneak Peek "Birhtday Fairy"
Hi everyone. Thank you fro stopping by today. Accessories: Copic Markers, Fleur Dis Les, Classic Circle and Lacy Circle Nestabilities, Light Pink and Dark Pink grosgrain and Green satin ribbons, Swarovski Crystals, All a Fleur Fiskars punch. 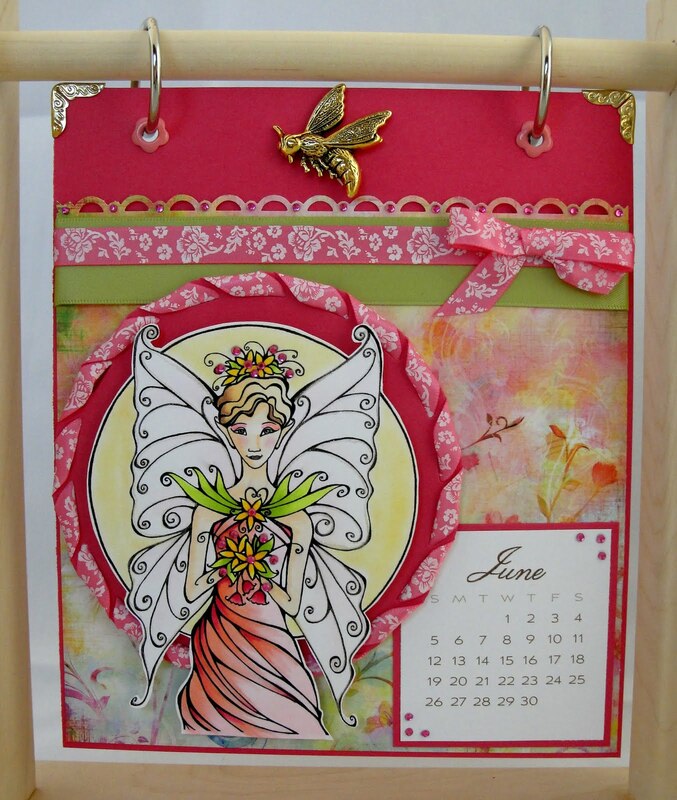 Here is my June Fairy Calendar. 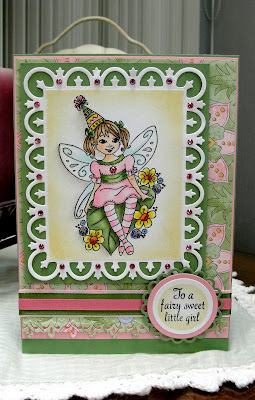 This lovely image is from Michelle Perkett Studio and is called "Lily the Fairy of Enchantment" I made this for Michelle's Bingo Challenge. I hope you like it. Here is a close up so you can see the glitter and crystals. It is still kind of hard to see but if you click on the image to enlarge it you can see it. Paper: Melon Mambo, Prima Fairy Floral, Georgia Pacific white. Accessories: Copic Markers, Spica Clear Glitter Pen, Gelly Roll Stardust pen, Swarovski Crystals, Celery Green and Pink Floral satin ribbons, Lacy Circle Nestabilities, Scallop Trim Border Punch, Bee Charm, Bonnies Best Metal Corners, Stampin Dimensionals, Mini Calendar Pages. Thank you all so much for stopping by today. I hope you have a wonderful weekend. Good morning blog friends. Today we are having a sketch challenge over at Paper Pretties and we would love it if you played along. Head over to Paper Pretties Blog for all of the information and show us your beautiful creations. We can't wait to see your work. Paper: Cajun Craze, Buckaroo Blue, X-Press it Copic paper and Still Fishing designer paper from Sweetwater. Accessories: Copic Markers, Stardust Gel Pen, Bubbles Cuttlebug embossing folder, Terracotta Tile satin ribbon, Classic Circle and Lables 1 Nestabilities. Stampin Dimensionals. Thank you so much for taking the time to visit today. Have a blessed day. Hello blog friends, I hope you are all well and safe from all the storms that we have been having. It has been such a rough spring for so many. Welcome to Paper Pretties Wednesday Challenge PWC155. 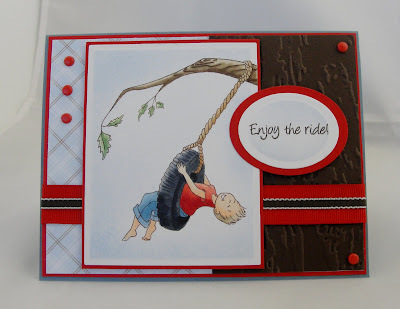 June is fast approching and this precious image "Tire Swing Cooper" from Paperpretties captures some summer fun. How many of us had a tire swing when we were young? Oh the care free days of childhood. I hope this card brings back some wonderful memories for you. Paper: Buckaroo Blue, Early Espresso, Real Red and Georgia Pacific White. Designer paper is a scrap I had in my stash. Sorry I don't know who makes it. 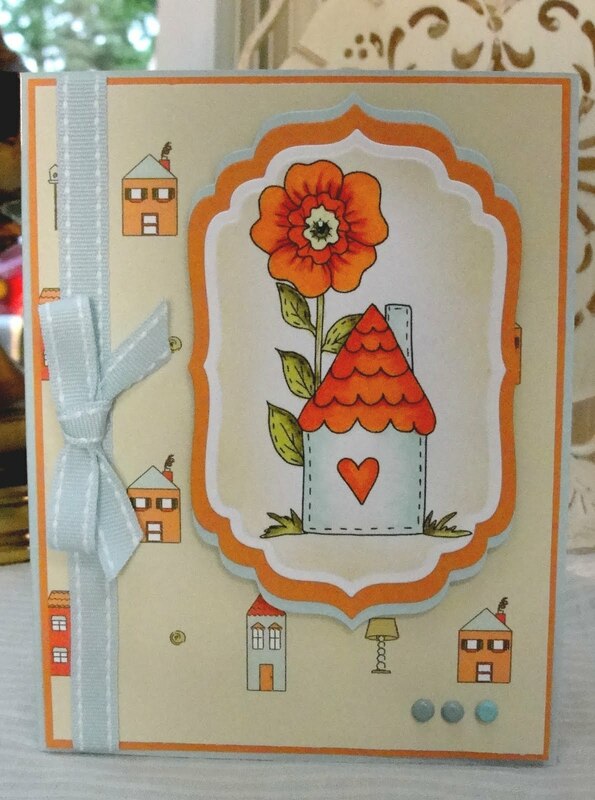 Accessories: Copic Markers, Classic Rectangle and Oval Nestabilities, Tim Holtz Wood Grain embossing folder. Real Red and Early Espresso ribbons, Red brads, Stampin Dimensionals. Thank you so much for stopping by today. You're the best. Hello beautiful blog friends. Thanks for stopping by today. 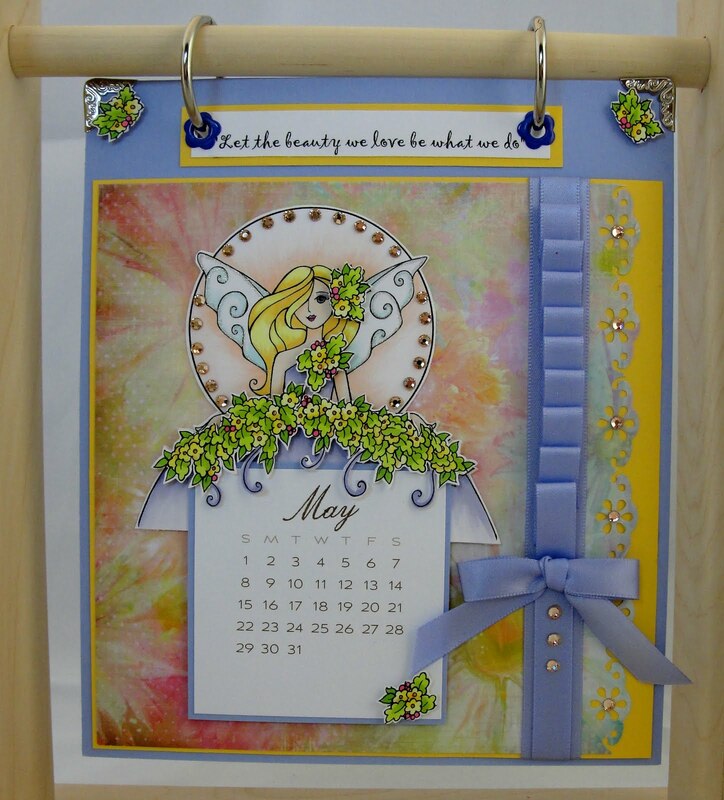 Well it just dawned on me that I have forgotten to post my April and May Fairy Calendars. Oh My, that's not good. Anyway, here they are. I hope you like them. I just love designing these calendar pages. For May I used a lot of satin ribbon and Swarovski Crystals. Can you ever have to many sparkles? Nah. 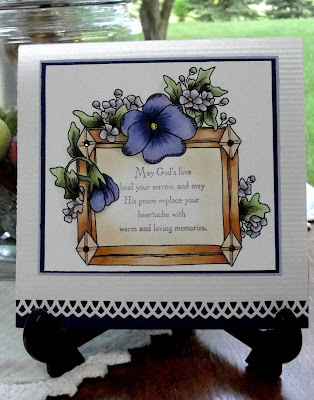 I also wanted to add dimension so I printed out another image and cut out the flowers and popped them up with Stampin Dimensionals. Stamps: Michelle Perkett Studios digi stamp "Willow", Paper Trey Ink "Calendar Basics"
Paper: Almost Amethyst, Daffodil Delight, Georgia Pacific White, Prima Marketing "Fairy Flora" designer paper. I wanted to to capture Spring for April and what better way than with butterflies. 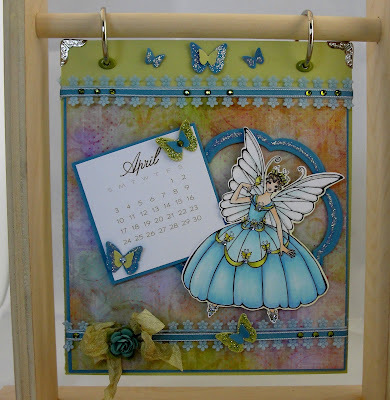 Stamps: Michelle Perkett Stuido digi image " Butterfly". Papertrey Ink "Calendar Basics"
Paper: Spring Moss, Marina Mist, Georgia Pacific White, Prima Marketing "Fairy Flora" designer paper. Accessories: Copic Markers, Swarovski Crystals, Martha Stewart's Butterfly punch, Oval Eyelets, Stickles, Blossom Nestabilities, Daisy ribbon, Marina Mist ribbon and Seam Binding ribbon that I dyed myself. 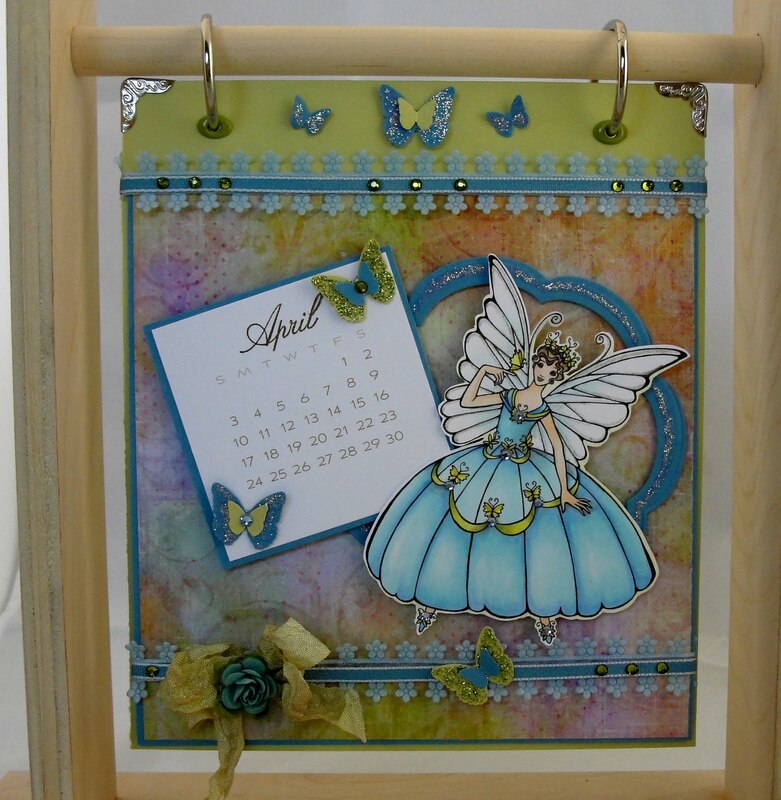 Bonnie's Best Metal Corners, Mini Calendar Pages from Papertrey Ink. Stampin Dimensionals. If you want to see more detail, just click on the picture. I hope you all have a blessed day. You're the best. Good Wednesday morning blog friends. I am so glad that you stopped by today. 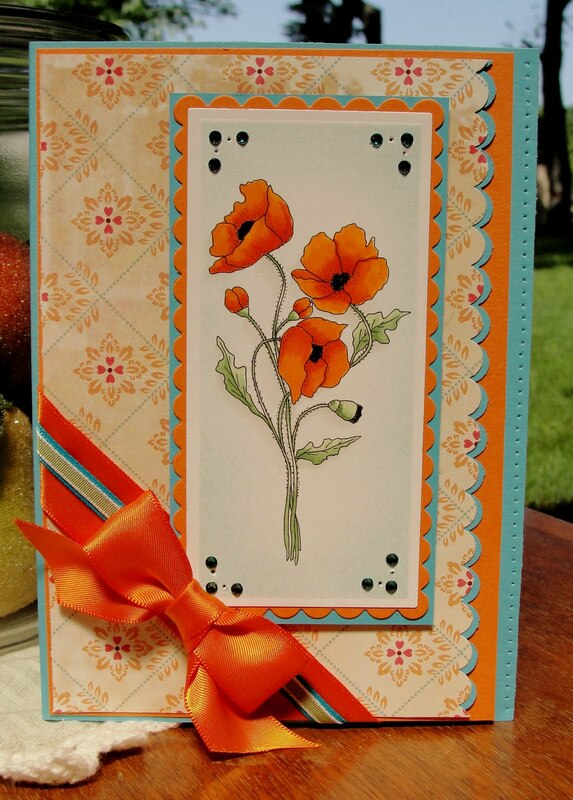 Here is my card for Paper Pretties Wednesday's Flower Challenge. I used Dream Quotes Stamp Set to make this for my dear friend's daughter who is graduating from nursing school. Congratulations Emily, I am so proud of you. I just love this designer paper from Graphic 45. It is called "Le Romantique" and I thought that it would be perfect for today's flower challenge and I the colors are so lovely. Now for the punched layer. I found this wonderful tutorial from Becca Feeken. Pleas visit her blog Amazing Paper Grace to see how make a "Perfect Punched Border Frame" with a straight border punch. Becca is a very kind lady who is so willing to share her amazing talent as an artist. Please take time to visit her and say hi. For this card I used Fleur de Lis border punch by EK Success. It was easy and her tutorial is very good. I wanted to layer the punched piece to make it pop so it adhered it to a piece of Peach Parfait with removable tape and just cut around it with scissors. When I was sure that I liked how it looked it adhered it with permanent adhesive. Paper: Always Artichoke, Peach Parfait, Whisper White. Accessories: Fleur de Lis border punch by EK Success, Labels 4 Nestabilities, Champagne Pearls from Kaiser Kraft, Willow organdy and satin ribbon, Stampin Dimensionals. Thank you for taking the time to stop by. I love hearing from you. Have a great day. Hello everyone. For some reason I lost this post from yesterday. Sorry about that. I guess that Blogger had some problems. Anyway here it is. This adorable image is one of Leah's digi stamps from Heart Song Designs and is called Bird and Berries. Leah started Heart Song Designs to help with the costs of adopting a little boy from Ethiopia. She is heading there in a week or so. Please help support her blessed endeavor by shopping at Heart Song. She is a very sweet lady and talented artist. You will love her work. God Bless you and your family Leah. Paper: Melon Mambo, Certainly Celery, Georgia Pacific White, Springtime Vintage designer paper. Accessories: Copic Markers, Labels 18 and Classic and Scallop Circle Nestabilities, Light Green satin ribbon, Stampin Dimensionals. Thank you so much for taking the time to visit today. Have a wonderful day. Good morning blog friends. Aren't you loving the Spring flowers and all the blooming trees. It is just beautiful and inspired this card. 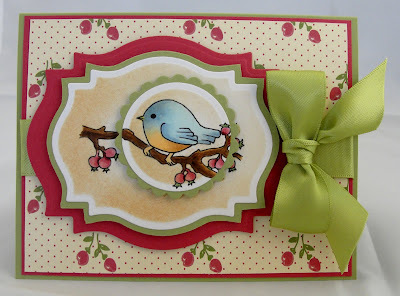 My image is from Leah at Heart Song Designs and is called 'Birds and Berries'. The layout is from a sketch challenge Leah had a while back and when I got this designer paper I knew that it would be perfect for this little birdie. Paper: Georgia Pacific White, Melon Mambo, Certainly Celery and Springtime Vintage designer paper. Accessories: Copic Markers, Spellbinders Labels 18 and Classic and Scallop Circle Nestabilities, Light Green satin ribbon from the dollar store. Stampin Dimensionals. Please keep Leah and her family in your prayers. They are preparing to go to Ethiopia to bring home their precious little boy they adopted. Heart Song Designs was created to help with the expenses of this process and will continue after their little boy comes home. Please help support Heart Song Designs. Leah has beautiful digi images and is a sweet, kind and wonderful artist. It is a privilege to be part of your design team Leah. God bless you. Thank you for stopping by today. I am honored that you would take the time to visit. I hope you have a beautiful day. I love Jesus and have been married to my best friend for 29 years. We have 3 beautiful children and are approaching the empty nest years. I have been enjoying paper crafts for 12 years and rubber stamping is my passion. I love my friends and spending time with them is one of my favorite things to do. Oh, and an important note, CHOCOLATE is never out of reach. The contents of this site are meant for personal inspiration only and may not be used for contest submissions or any other publication purposes. Thank you so much for your support.